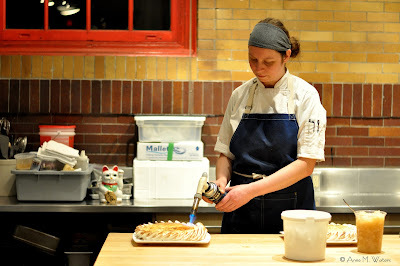 Chef Michelle Marek handily torches the maple meringue on the maple cream crêpe cake. I have a bi-polar relationship with multi-course, wine-matched dining out experiences. Last night's Quebec Terroir "Temps des Sucres" at The Urban Element was no exception. 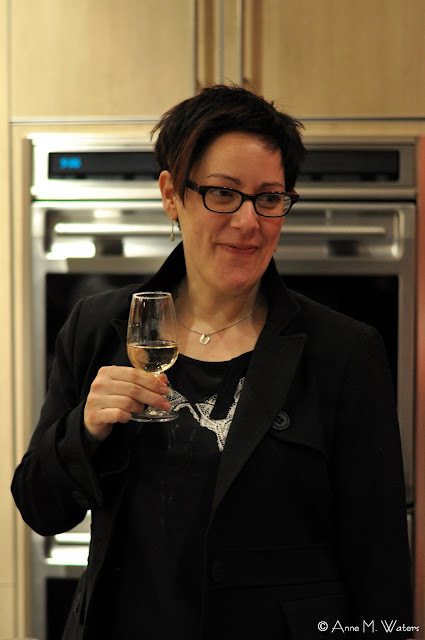 Shawna Wagman, Food Editor at Ottawa Magazine and our host for CITY BITES LIVE! 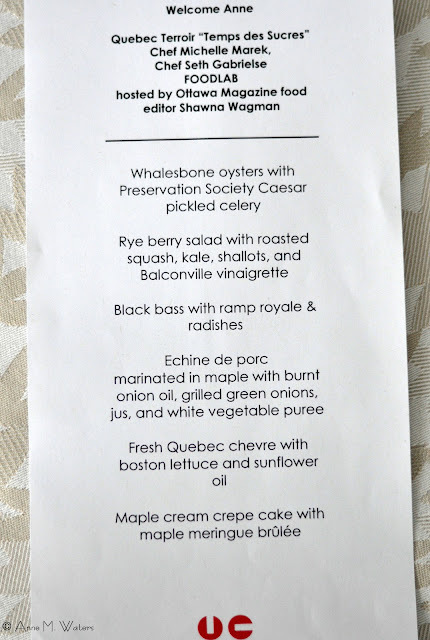 Shawna Wagman, Food Editor for Ottawa Magazine was hosting Montreal's Foodlab chefs Seth Gabrielse and Michelle Marek, both formerly from the kitchen of Montreal's bistro Laloux. Chef Seth Gabrielse shares in the dessert plating. Shawna's connection to the pair is through Michelle. Their significant-others were in grad school together at McGill. My connection to the pair is from dining out a few times at Laloux when they were at the helm. Michelle's cardamom panna cotta with carrot sorbet remains memorable. Shawna started the soft sell on me back in early December with a hint and a Twitter tease. The news was formally announced on her Ottawa Magazine blog at the end of January. Then the dilemma began. Do I go? At $150 plus tax, it is a pricey evening out. I have a bit of a value shopper bent and struggle to assess premium pricing when I want to indulge. The description was intimating to anyone's health with words like marinated in maple, burnt onion oil and meringue brûlée. As chef Marek said last night regarding these multi-course dinners, "sometimes you feel like you are facing your death at the end of the meal". Truth be told, I am not much of a wine drinker either. Many pours will go unfinished. Oh what to do? The sale for the 18 tickets seemed to move slowly. I wondered who in this town was even aware of Gabrielse and Marek's top talents. 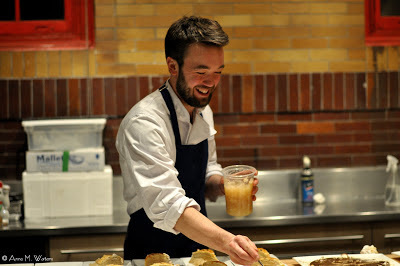 They left Laloux in late 2011 for SAT's Foodlab, a not-for-profit, artistic culinary adventure into food research. No kitchen, no phone, no equipment to start, not even water, they chose to see this as opportunity as opposed to adversity. Ego-centric chefs need not apply. Maybe not celebrity rock star status yet - and I doubt that moniker is actually their ultimate mark of success - this fledgling food lab is becoming well-known. Their work is impressive enough to garner attention from the New York Times after just 9 short months at the lab. TV crews have been all over them. 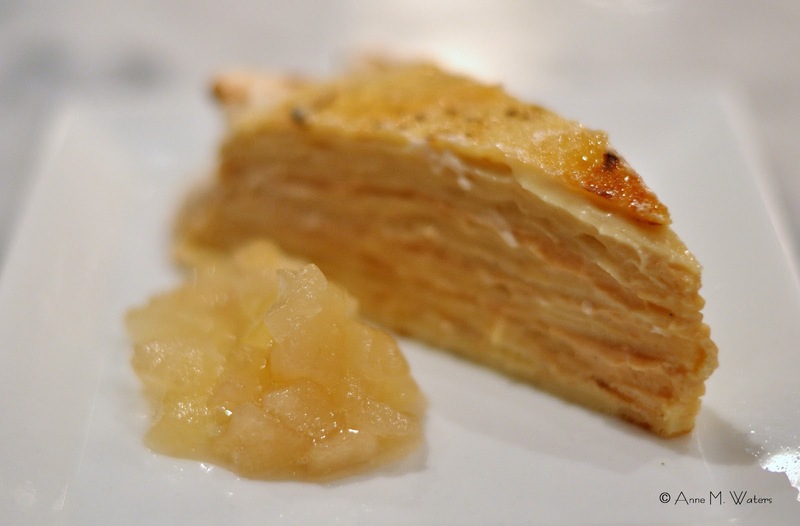 Thankfully there will be an episode coming up where I finally will learn how to make Chef Marek's strudel as she visually will walk us through the method for her well-guarded recipe. Michelle took a shot at running cooking sessions only to find out it was not for her. Hopefully TV will be more her thing. They are also being featured in an upcoming Bon Appetit Magazine. Gabrielse and Marek's low key Ottawa profile was partly what pushed me into going last night. I was hoping my dining confreres were there more out of food curiosity than the buzz that can go with coveting a private dinner with a more recognized name of a star-studded celebrity chef. I don't want to go to say "I was there" or "to be seen". Dining out for me is a quiet, personal affair. So with a single ticket remaining unsold for days, on Monday, just 5 sleeps away, I moved the event to 'sold out' status. No regrets. Seth's roots are Dutch and Michelle's are Czech. To not be born and raised in La Belle Province, means their interpretation for Quebec Terroir "Temps des Sucres" would bring a less traditional perspective. In the intro to the evening, the chefs were quick to dispel my concern for 'the end of evening hangover'. They take meal pacing very seriously and feel that it is the responsibility of the kitchen to move you gracefully through the courses - not just your taste buds but also all our digestive and vital organs. For the most part, they lived up to their promise. Although I thought the pork dish was a bit hefty. Its delicious, tender, maple flavour didn't stop me from finishing and near licking the plate. 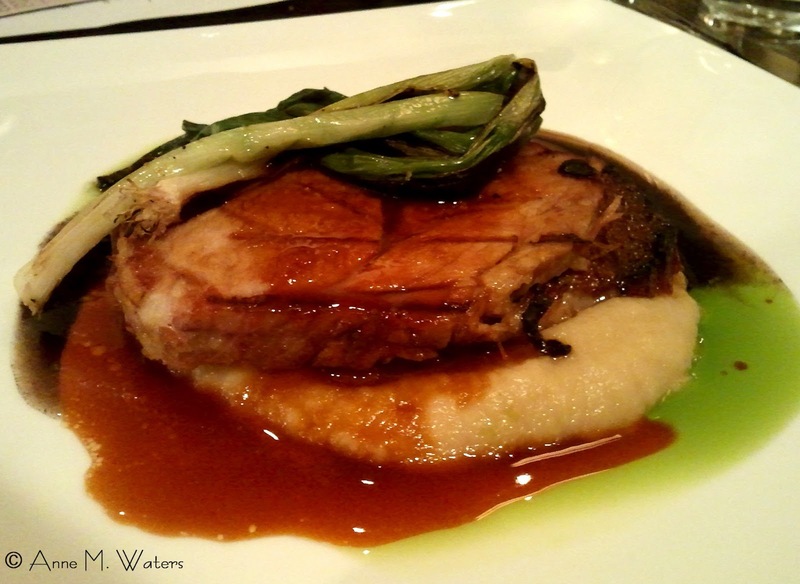 Echine de porc marinated in maple and citrus juice with burnt onion oil, grilled green onions, jus, and white vegetable purée. I gave my dessert a good college try but for me, pork followed by a big slab of goat cheese and then a carb bomb dessert with cream and sugar meant that I was done. Delicious but just too much. I didn't even touch the last pour, a Riesling. Maple cream crêpe cake with maple meringue brûlée and apple sauce. Knitted through the evening were fun food finds. 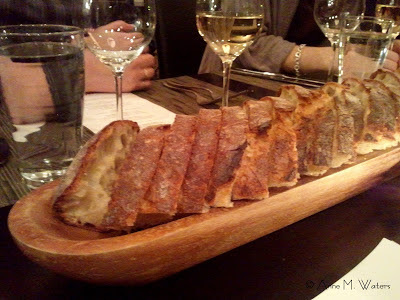 The bread on the table was from a new bakery at Montreal's Jean Talon Market called Joe La Croûte. Owner Daniel Jobin, studied specific techniques of kneading in the south of France with Benoît Fradette, formerly of Montreal's Le Fromentier. Bread from Joe La Croûte in Montreal's Jean Talon Market. Our oyster was garnished with heat packed Preservation Society's Caesar Celery. 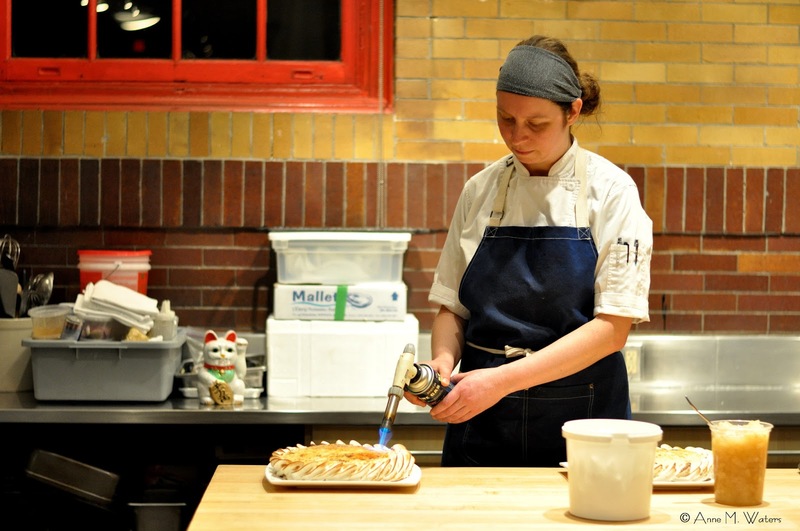 Montreal-based Preservation Society is known for their small batch preserves. 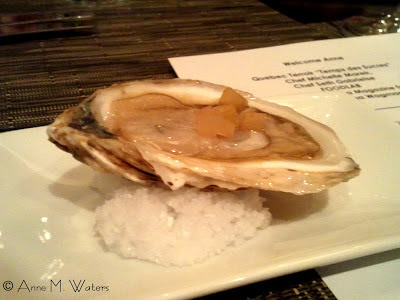 Whalesbone oysters with Preservation Society's pickled Caesar Celery. Many star ingredients came from Société-Orignal, a Montreal-based 'rare foods' company. The cold-pressed sunflower oil and the Balconville vinaigrette on the salad and cheese plate were but a few. Rye berry salad with roasted squash, kale, shallots, and Balconville vinaigrette. 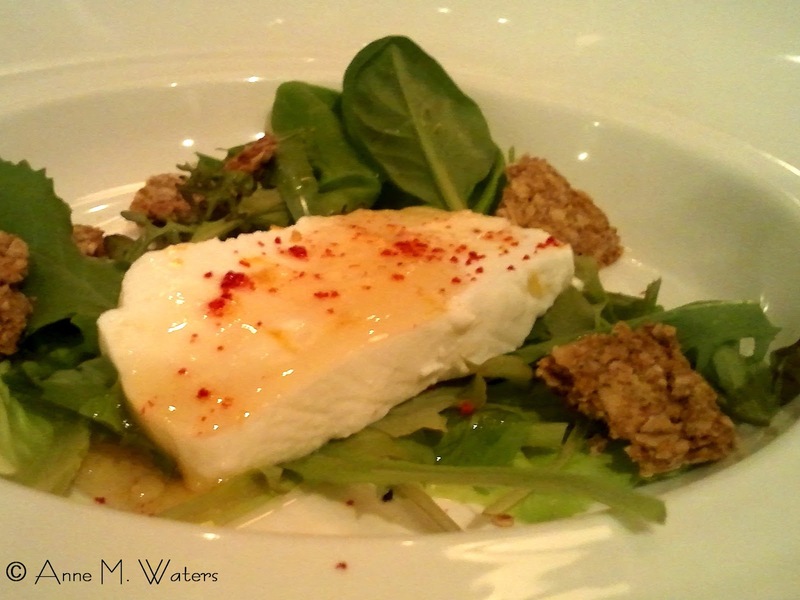 Fresh Quebec chèvre with Boston lettuce, mixed greens, oat cakes and cold-pressed sunflower oil and espelette. Société-Orignal is not just a distributor. They work actively with purveyors to create best of breed products - the sunflower oil coming from a specific stand of plants with maximized sun exposure; the maple syrup developed from a specific part of the woodlot vs. a blend of the farm's full acreage of trees. Chris Nuttall-Smith describes them better in his October 2012 Globe and Mail article, "Yet the most interesting thing about the venture is how promising its model is for the future of small but innovative family farms. Rather than peddling the usual commodity products, or the typical farmers’ market offerings, Société-Orignal focuses on unique, unknown and under-appreciated foods, and then finds them high-value markets. The appetite for this sort of product, the company is discovering, is limitless so far." I think we need to keep an eye out for that name. Lucky for Société-Orignal to be moving into Williams-Sonoma stores, remaining under their label. But maybe not so lucky for us. I have to wonder when specialized products go nationwide with a chain, how does one preserve their identity around specialized and rare foods, while still maintaining the original standard of high quality. I even learned a food tip for myself. Seth said he poached his young ramp leaves, laid them flat to freeze and then carefully wrapped them to store. A trick I will try come May when they are in season. His pickled ramps are based on Tom Collicchio's pickled ramp recipe. Both leaves and pickles were featured in the seafood dish. 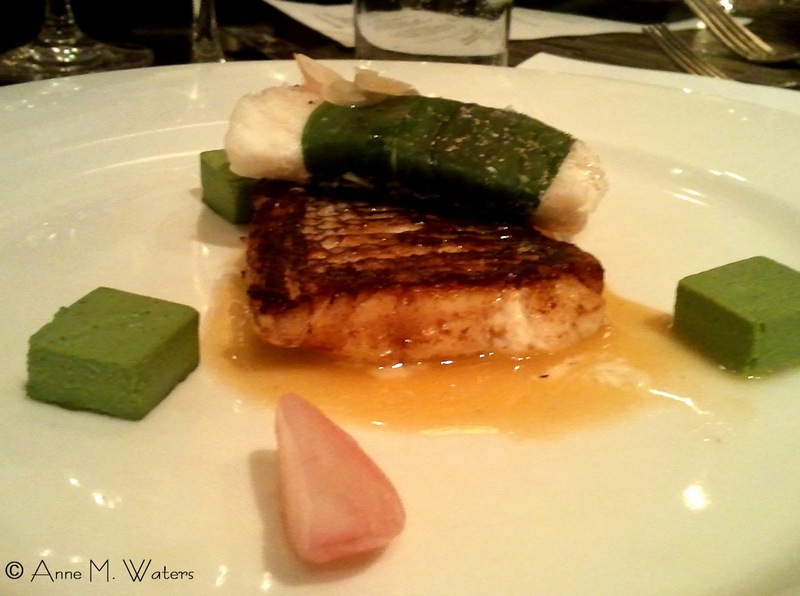 Black bass with ramp royale, ramp leaves, pickled ramps and radishes. The Urban Element team, including house chef Anna March, did a great job of supporting Shawna and guest chefs with the pace and logistics of the evening. Their pairings for the meal were Norman Hardie wines from Prince Edward County. Our meal, save dessert, was served at the long communal table. Place cards were laid out for direction. Full credit for somehow knowing my left-handedness and seating me at the right side of the head, allowing for plenty of wing space as I lifted my fork. Of course the food was exceptional. But I think what I enjoyed most of all was the chance to converse with others who also share a genuine love of food. I barely left the table to check our guest chefs in action. When it came time for the Q&A, my list for the chefs was too long. We didn't even touch a favourite topic of mine - food styling. After all we eat with our eyes. So there in lies some more of that bi-polar feeling. 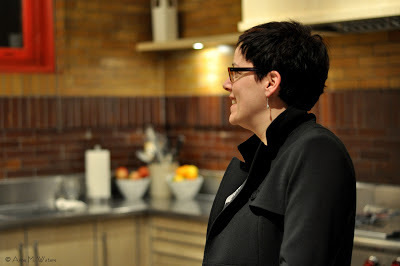 I come for the tastes and wizardry in the kitchen and I leave reminiscing about the conversation and good company. 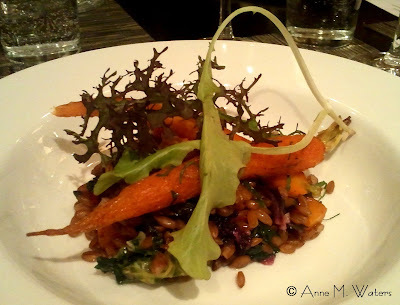 Foodlab SAT (Labo Culinaire) is located at 1201, boulevard St. Laurent on the less than posh side of town in Montreal. They do dinner service Tuesday to Friday from 5 - 10 pm. Their menus are themed and change typically in two week rotations. Call ahead for reservations 514-844-2033 ext. 225. Bravo! You did a wonderful job of capturing the essence of the event. I really appreciated Michelle and Seth’s passion for food and their deep respect for the products that they use. I also admired their courage and startup spirit. With no template to guide them, they took the food lab opportunity and ran with it. I found their story very inspiring. My only disappointment was that they excluded ployes from the menu. I have fond childhood memories of eating those. It was also lovely to share the evening with others who love and appreciate good food. Des gens très sympa c'est sur. I was a little apprehensive about signing up solo, but I'm glad I did. Nothing ventured. Nothing gained. Carmen, I was in Montreal on Friday and we decided to stop in at SAT Foodlab for dinner. Seth came by the table for a visit. He has a good memory for faces! It was also a very special dinner and I would recommend it if you get to Montreal. It is reasonably close to Old Montreal if that's where you end up staying.